here it is! 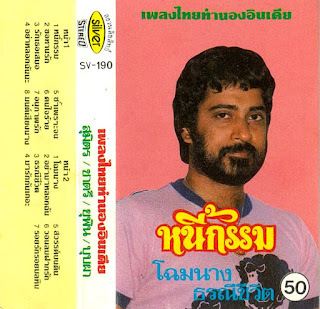 the first major find since returning to bangkok: a greatest hits of thai songs featuring indian rhythms! although tracks 7 to 14 have been featured on this blog already, this collection is full of great new tunes from phraiwan lukphet, phet photaram and the star of the show, sumit satchathep! sumit was born to a family of indian silk merchants in bangkok's bang rak district. although his upbringing instilled in him an appreciation for the music of his mother country, his surroundings influenced him as well, and at the height of the brief 70's luk thung-bollywood craze, the scene found its first bilingual voice. teaming with chatri sichon's former partner yuphin phraethong, sumit had a run of duet & solo hits in the late 70's. the first track here, written by surin phaksiri, was his biggest single... most versions today have clipped the flute intro because a skip in the master recording, but i decided to leave it in. hope you enjoy! great, dig up some new sounds Peter! ah its gone! damn! would have loved to have heard this. great blog btw! !